Raul was the last autograph that I got from the LNF Bowling Tourney. It was one of the more memorable ones as Rod Babers came up and harassed Allegre about his picture on the back of his 1989 Score Supplemental card. He laughed and remarked about how young he looked, and Rod told Raul’s son that he looked just like him. Raul is an extremely active member of the NFLPA and is Vice President of the Austin chapter. He’s an ESPN Deportes commentator and has also handled the color commentary for Monday Night Football in Espanol. Raul Allegre excelled at soccer in high school, which led him to become a kicker in football. He attended Montana and then later the University of Texas where he was 67/69 on extra points and 28/46 on field goals. A free agent signee by the Colts in 1983, Allegre stepped in and actually went to the Pro Bowl following the 1985 season going 16 of 26 on field goals and 36 of 39 on extra points. Following the 1985 season, Allegre lost a pitched training camp battle to Dean Biasucci. He did not see action until midway through the 1986 season, when he was an injury replacement for the New York Giants. He held the position down with the Giants through their 1986 and 1990 titles. He was notable during his stint with the Giants for his accuracy under pressure. Cut in 1991, he quickly signed with the Jets, but retired in 1992 after losing out to Jason Staurovsky in training camp, citing lingering back injuries. In 1992 he briefly entertained a comeback with the Houston Oilers and was considered for the kicker job there, but lost out to Al Del Greco. 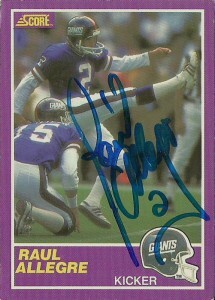 Raul is a member of the original Tecmo Bowl as the Giants’ kicker.